This example has lost the original jewel or pearl setting, it would have also had a second drop pearl suspended from the feet. The eagle was a very symbolic bird, one of great majesty and power. 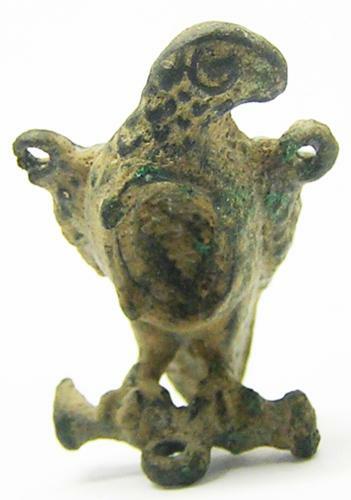 A similar Eagle pendant of King Sigismund Augustus of Poland. (Spanish Pendant mid-16th century) held in the National Museum in Warsaw. This is a rare excavated piece, originally worn by a Spanish nobleman or statesman, either as a mark of rank, valour or as membership to a Knightly Order..